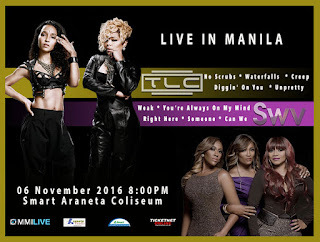 90s Faves, TLC and SWV, To Perform LIVE In Manila This November! Tickets to TLC with SWV Live in Manila will go on sale on September 17, Satruday at 10:00am via ticketnet.com.ph. For more information on tickets and reservations, you may follow #MMILive (on Instagram, Facebook and Twitter) or visit www.ticketnet.com.ph, or call 911-5555.